I like to spend the last half of my lunch hour running to two consignment shops and one consignment/antique shop in town. I live in a small town so it's doable, but I don't have a lot of time. This little silver plate sugar scoop is marked with a "made in Japan" sticker. I loved the floral pattern, and it was $3 and in good condition. I should say "I think it's for sugar". 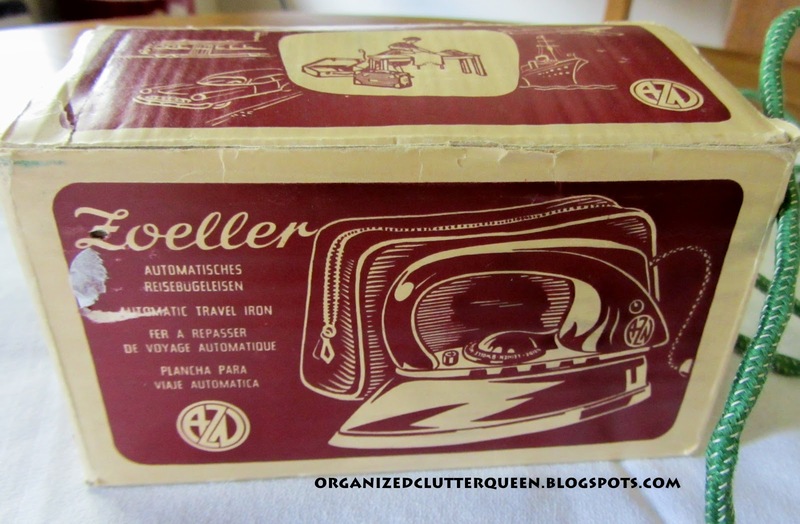 How about this cute little travel iron in the original box? It's a Zoeller, made in West Germany, in mint condition. I think I can display it in my laundry room with 2 other old irons. Also in the Zoeller iron box is the cute little plastic, zippered travel iron bag. 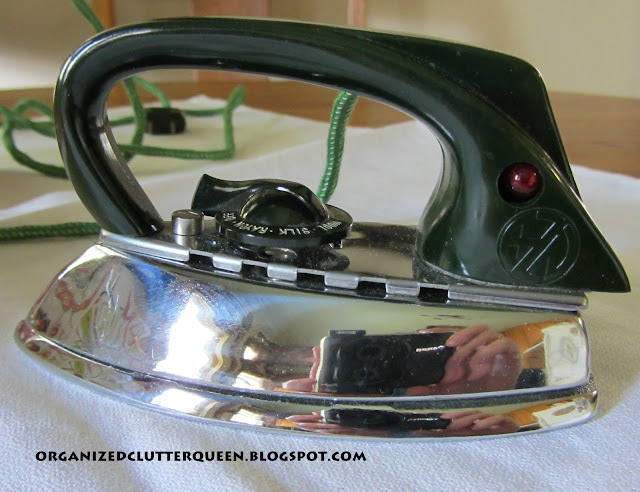 I think this little case sold me on the iron at $6, it's soooo vintage. 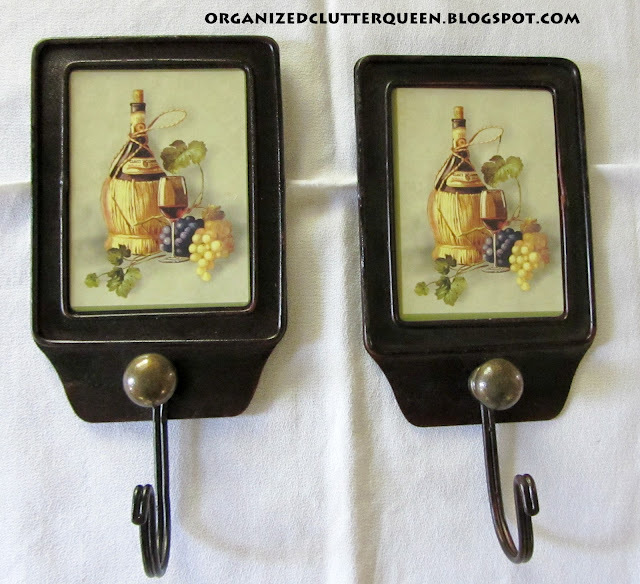 These wine inspired black metal hooks were unmarked. They seemed like they might be vintage as the metal was quite heavy, unlike flimsy stuff made now. $3. 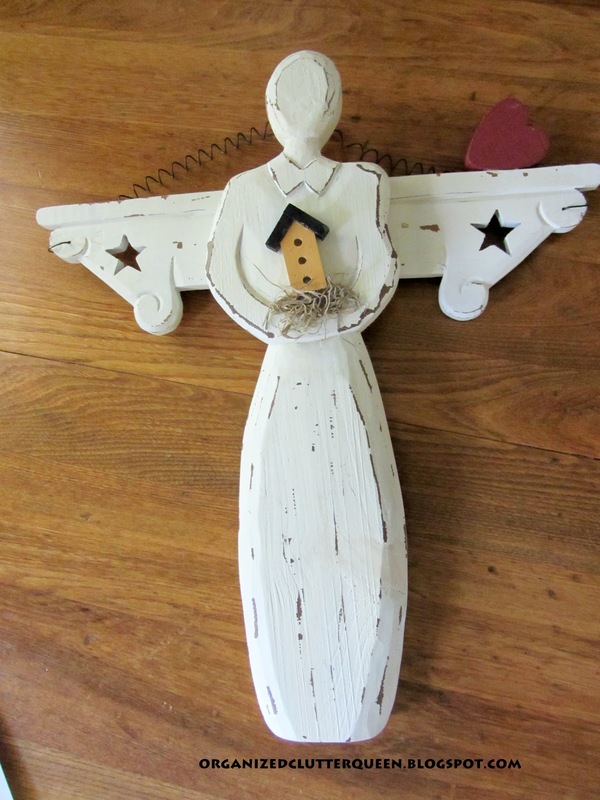 Just picked up this white, distressed, garden angel today for $4. Marked 2002 Coyne's and Company. Great condition and thick wood construction. This will hang outside somewhere sheltered. Also not marked. $2.50. Three black metal keys with gold accents. They will appear somewhere in a vignette. What great finds! I love the little sliver bowl too. I think it might be for jam or jelly. We should google it..
Love all your finds! And with the bargains you made, I think the chair is justifiable. Each piece is truly adorable. 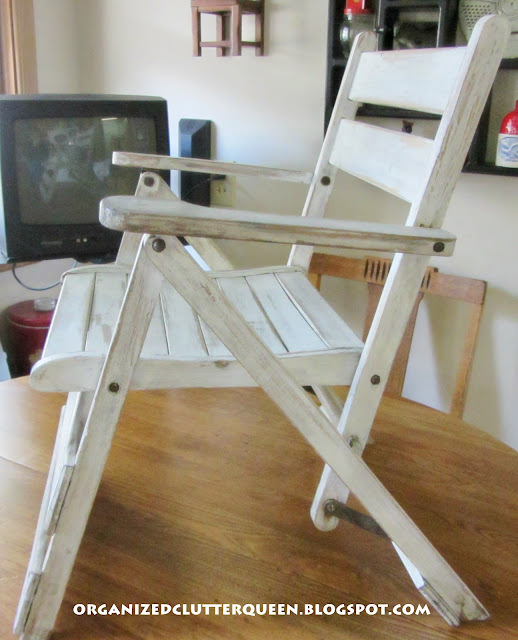 You got some really cute things, especially the child's folding chair. The old iron reminds me of a travel iron my mom had..it was so heavy and the handle folded down. It'll be cute in your laundry room. The silver sugar scoop is my favorite. It looks like those are roses on there...how pretty. 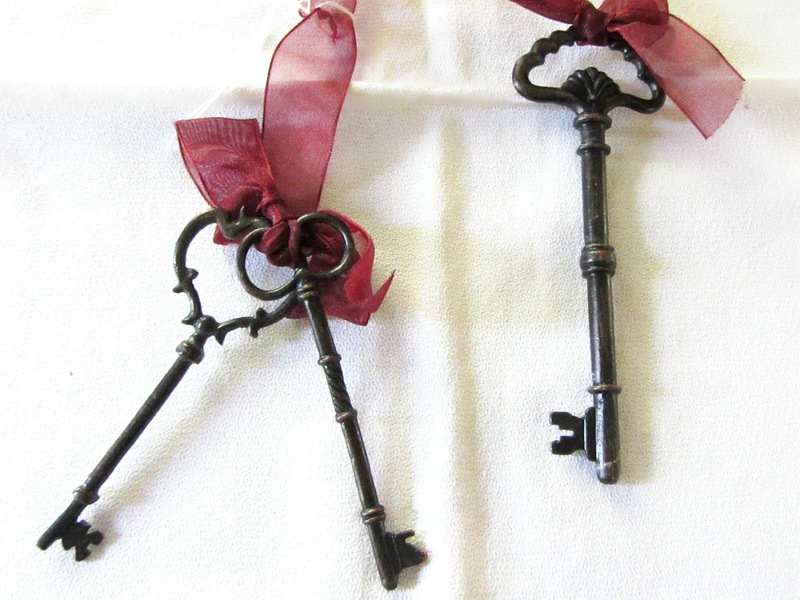 The keys look very similar to the ones that I bought Jess not long ago. We both love keys and collect them. What great items you found! 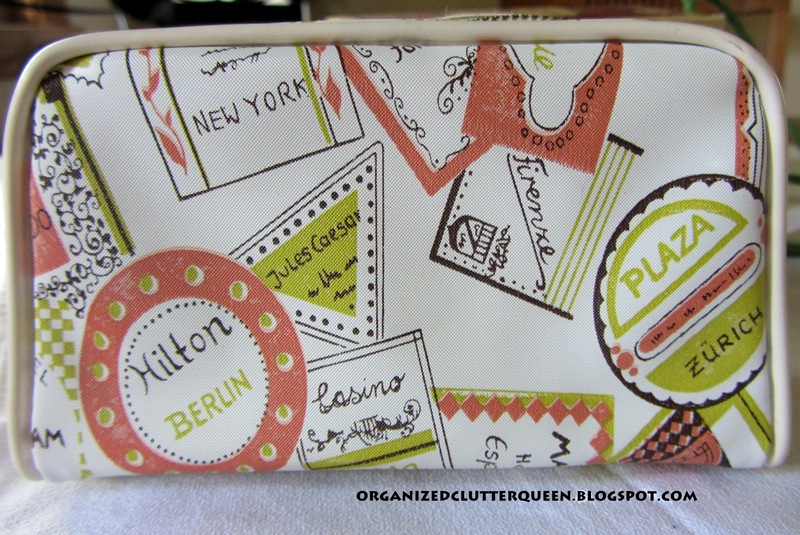 Love it all but really love the iron, it's box and the zippered little bag. So cute! Thanks for sharing. Love that old iron! It will look great displayed with some others in your laundry room. I bet it's heavy. Thrifting- even when pressed for time- is the best! Thank you for sharing at Cowgirl Up this week. Love having you at our party! That silver bowl is so pretty! I just love it all! I love the iron!! That is so cool! You have some great finds but that sugar dish with the scoop is devine. I love it. Have a great day! You're a very lucky lady, you found a really awesome things! I adore that sugar dish! Okay the sugar scuttle and the lawn chair are my favs. Thanks for sharing at Cowgirl Up. Awesome vintage finds!! You are so lucky to have some thrift shops to visit on your lunch hour. You found some amazing finds for such little money. Love the child's lawn chair! Such wonderful pieces....I have never seen one of the sugar holders and scoop. How neat! Great finds! I love the sugar scoop and the tiny chair is adorable. What a great way to spend your lunch hour. It sure cuts down on the calories and you get some great stuff too. Love the lawn chair. Worth every penny. You found some wonderful "treasures" and you're right...you HAD to get that chair! Plus, you saved so much on the other stuff why not? You always find such neat things! Love it all! Can't wait to see where it all ends up. You sure found some great things! I wish I could go thrifting with you! Great finds! I wish there were shops closer to work so I could do the same on my lunch hour. Thanks for linking up this week on Share the Love Wednesday! Carlene wow I wish the thrift store here were close to work!! Great Finds! When I pay a little extra for something I like to cost average the buys!! Ha! 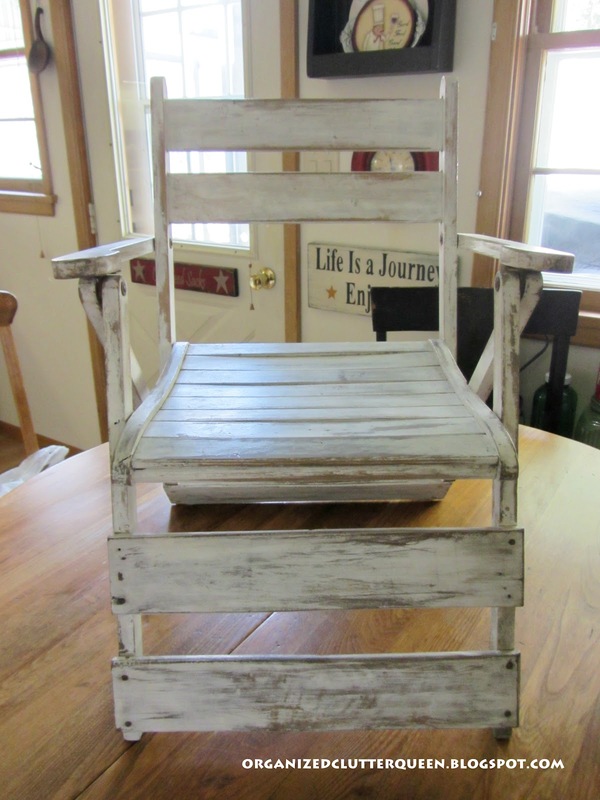 I hope you will stop by and see my new Annie Sloan Projects Revealed!! That scoop is awesome! And the not so thrifty child's chair called my name too. I ADORE that gorgeous sugar holder with the hanging scoop! It's just too, too precious! Really great finds, I'd give up eating for thrifting anyday! Hi Carlene! Great finds! 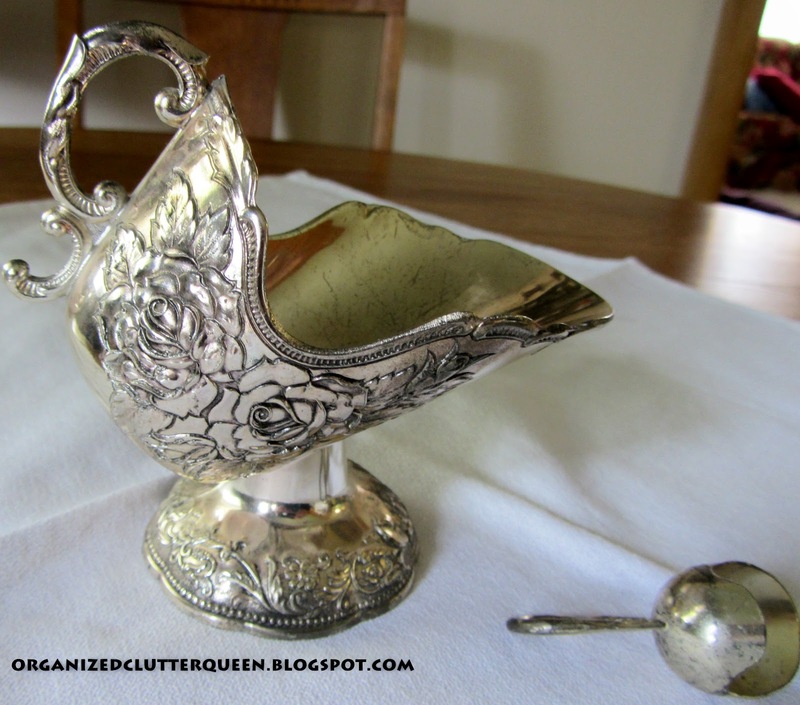 That Silver SUgar Server is stupendous! Keep an eye out I have seen that pattern on a whole coffee/tea service. Sorry I don't know the maker or pattern name...I don't really collect silver...,but I have seen it in the antique mall. I know you're in Minn. but I'll keep a look out for ya here..maybe if I see some(in our price range which you scored at $3) I can let ya know. 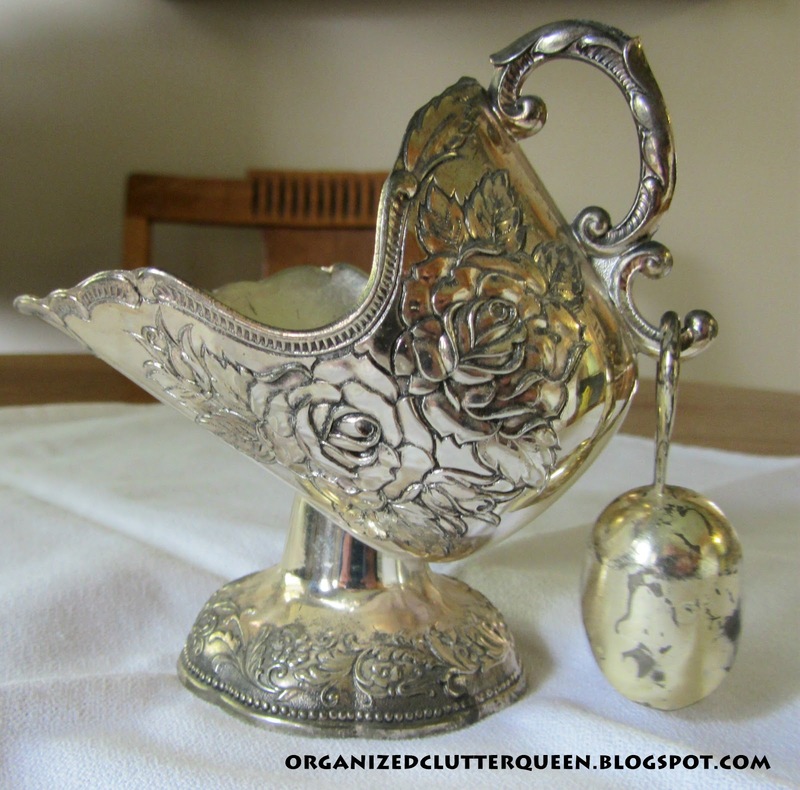 Oh I love the silver sugar scuttle! I have one but, not nearly as decorative as this one. And a great price! You found some awesome treasures to share with us! Thank you for sharing with us at TTF and have a wonderful day! I received a silver sugar scoop exactly the same as a wedding present but lost it among other things in a move .. very cute..